Background: One of the main concerns for patient safety in disaster is continuous patient trace from disaster scene to a care center, including victims' identification, data register at the scene, records of the initial medical assessment, real-time alerts regarding patients' situation, and update location of them. This process is called patient tracking which promotes their safety and reduces number of victims and secondary problems caused by disaster. The aim of this study was to review the literature and evidence of patient tracking in disasters. Materials and Methods: This was a review study which was performed through databases, journals, and available electronic resources in the case of a contract with the Ministry of Health. Inclusion criteria included the resources regarding the concepts, considerations, and components of patient tracking and related patterns for tracking the patients who were injured in disasters. Data were collected through taking notes, were analyzed by content analysis, and were presented in two categories. Results: The review and evaluation of the results obtained were classified into two areas: The findings of the research showed that 40% of references were pertained to patient tracking concepts, considerations, and components, and the rest of them were related to the implementation of the tracking system and patterns in the exercises and rarely at disasters. Conclusions: Identification and tracking of natural disaster's victims is a vital role to collect important information and facilitate communication in a timely manner which helps to address patients' medical needs, reduce duplication activities for them. Also classification and distribution of this information among health officials and institutions is a national necessity. This important issue facilitates to do preparedness plans for disaster response and to reduce people losses in the community. This important issue facilitates to do preparedness plans for disaster response and to reduce people losses in the community. Introduction: Hospitals are the most important treatment centers in case of occurrence of disasters. Therefore, ensuring the maintenance the structural and functional security of hospitals in critical conditions is a necessary issue. Creating safe hospitals cause the creation of assessment instruments such as risk assessment. Risk identification as the first step in enhancing preparedness of hospitals for disasters and trying in creating vital factors such as trained personnel, safe and accessible equipment. Doing assessments continuously can provide information necessary for enhancing the system. Methodology: The present study is a descriptive-analytical one conducted using a cross-sectional design in 2015 in Social Security Hospitals in Isfahan Province. To investigate the risk assessment, the Hospital Safety Index Standard Questionnaire was used. It was developed into two sections of general information of hospitals and in the second section; it includes 145 indices in structural, functional, and nonstructural fields. To complete the questionnaire, in each hospital, questionnaires were completed via observation and interviewing the owners of the process. The weighting method was based on the hospital safety index from 0 to 2. Data were analyzed using Excel software. Results: Investigating the results of safety in the three hospitals indicated that hospital 1 with about 64% has the highest level of preparedness and hospital 3 with about 62% has the lowest level of preparedness. In general, the three hospitals were at level B in terms of safety. Conclusion: The results obtained from the safety hospital index in the studied hospitals indicated that the safety level in the tree hospitals is at the moderate level. Although the state of them is not critical, they need planning and conducting measures necessary for improving safety levels, and these hospitals require necessary short-term measures for reducing damages. Background: A large part of total dose resulted from the natural sources is due to the environmental radionuclides such as 238Th and 238U decay chain and 137Cs and 40K radioisotopes. Given the importance of identifying environmental pollutants and protection against them. Materials and Methods: In this study, the activity of the terrestrial radionuclides was analyzed in different parts of Iran, and their biological risk was reviewed using parameters presented by international organizations such as United Nation Scientific Committee on the Effects of Atomic Radiation. 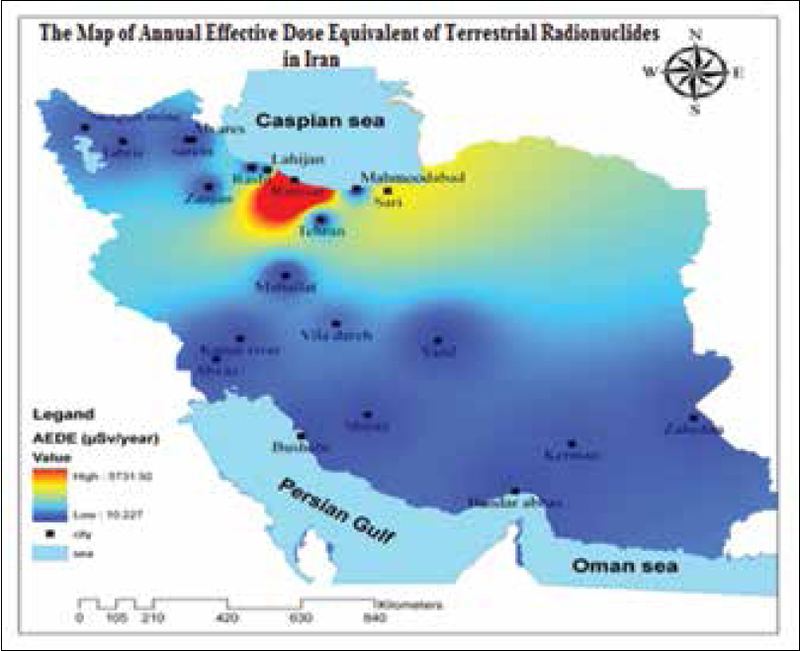 Effective dose equivalent map resulting from Iranian terrestrial radionuclides was prepared by using of ArcGIS software and Inverse Distance Weight method. Findings: West of Mazandaran Province, especially the Ramsar region and Villadareh village in the Ardabil Province are reported critical based on standards, and there is need to additional studies to or not to carry out environmental measurements in these areas. Introduction: Self-care activities are crucial for managing diabetes nephropathy (DN), and there is not enough data on this in Bangladesh. The main target of this study was to identify the qualitative differences of self-care activities between patients attending government health facilities and private health facilities. Materials and Methods: This is a cross-sectional study conducted among the patients of DN attending government health facilities and private health facilities in Bangladesh using self-made survey question, and SPSS software version 16 was used for analysis. Results: A total of 200 (n = 200) patients were taken, 100 from government health institutes and 100 from private health institutes. In both sectors, most of the patients were between 51 and 70 years old. In government sectors, the percentage of following healthy eating plans all days of a week was 47%, at least 30 min of physical activities on a regular basis was 39%, blood sugar testing at least once in a month was 79%, washing feet on all days of a week was 63%, having fruits/vegetables all days of a week was 27%, glomerular filtration rate (GFR) checked within the last month was 17%, having high-fat diet all days of a week was 22%, and having fried food all days of a week was 38%. In private sectors, the percentage of following healthy eating plans all days of a week was 76%, at least 30 min of physical activities on a regular basis was 58%, blood sugar testing at least once in a month was 88%, washing feet on all days of a week was 91%, having fruits/vegetables all days of a week was 63%, GFR was checked within the last month was 42%, having high fat diet all days of a week was 35%, and having fried food all days of a week was 42%. Conclusion: The patients of DN attending private health facilities were comparatively more aware and serious about self-care than the patients attending government health facilities in Bangladesh, and government health facilities should provide awareness program on this aspect. Background: The night of August 6, 2010, brought a rare natural phenomenon called cloud burst, which in a fraction of second devastated many parts of Leh and its surrounding areas leading to extensive loss of lives and properties. This article aims to explore the pattern of casualties and new challenges and recommendation based on the management of such rare natural disaster at multispecialty hospital. Methods and Results: A descriptive study of total 548 cloud burst-related casualties was carried out at multispecialty hospital, Leh. Totally, 297 (54.1%) casualties were attended in the first 10 h. Totally, 128 (23.3%) patients required admission. 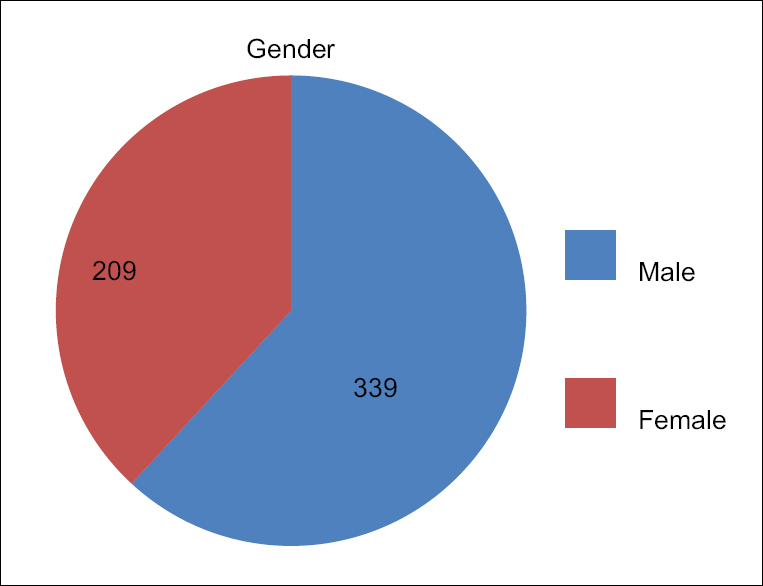 There were 339 (61.8%) male and 209 (38.1%) female patients. 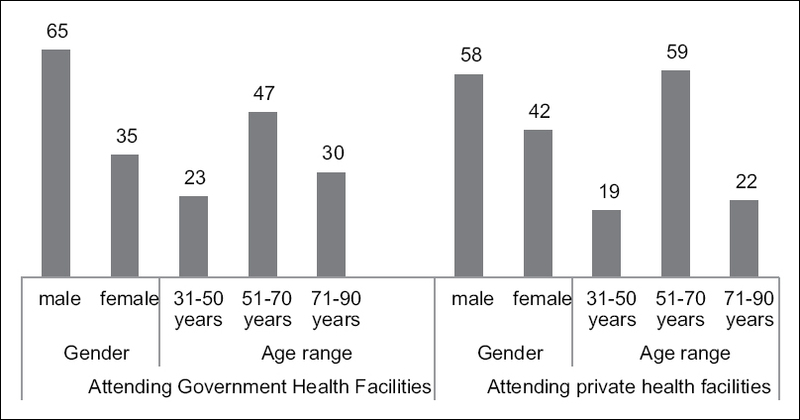 Maximum numbers of patients were in age group 31–40 years followed by 21–30 years. Maximum number of cases suffered from lacerated wound (n = 269, 49%) followed by polytrauma (n = 117, 21.3%), multiple abrasion (n = 75, 13.6%), fractures (n = 38, 6.9%), chest injury (n = 26, 4.7%), pregnancy with lacerated wound (n = 12, 2.1%), and least of head injury (n = 11, 2%). 180 (32.8%) patients were having associated ocular injuries. Few patients (n = 39, 7.1%) developed dermatological conditions when they were followed up in OPD. 26 people declared dead at the reception. Only three patients had fatal outcome during hospitalization phase. Conclusion: A practical, well-coordinated, and frequently practiced hospital disaster plan is very essential to reduce morbidity and mortality. Ocular injuries were associated with most of the victims due to mud infiltration into their eyes. Information about admitted patient as well as preparation of good informative data in calamities and disaster is equally important in the management of disasters. Background: In this article, we describe a study which is based on a project with the overall objective to contribute to the enhancement of health in Kenyan rural communities, particularly in crisis situations. The purpose of the project was to improve the capacities for crisis preparedness and the incident and emergency health care both in higher education and among the health care stakeholders. Materials and Methods: Disaster response and emergency management fact sheets (FSs) and evaluation material are used as research data in this study. The main research questions were as follows: (1) Based on student work, what are the main recommendations for the enhancement of crisis preparedness in Kenyan rural communities? and 2) How effective is an intensive course as a method to meet the objective to enhance crisis preparedness in Kenyan rural communities? Results: Research results include recommendations for the community. These are the enhancement of the awareness of safety questions, the improved availability of information, developed safety routines and the enhanced personal responsibility of each community member. The results also show that the held intensive course met its objectives fairly well. Concoctions: The 2-week intensive course with a few days of field work had a moderate impact in the chosen community and a good impact on the students' learning process. The students were able to give relevant recommendations in their FSs for the enhancement of disaster preparedness in the chosen geographical area. They also seemed to understand the limitation of their work and they reflected on these limitations in an ethical manner.